Every team needs a Chloe Wheeler. 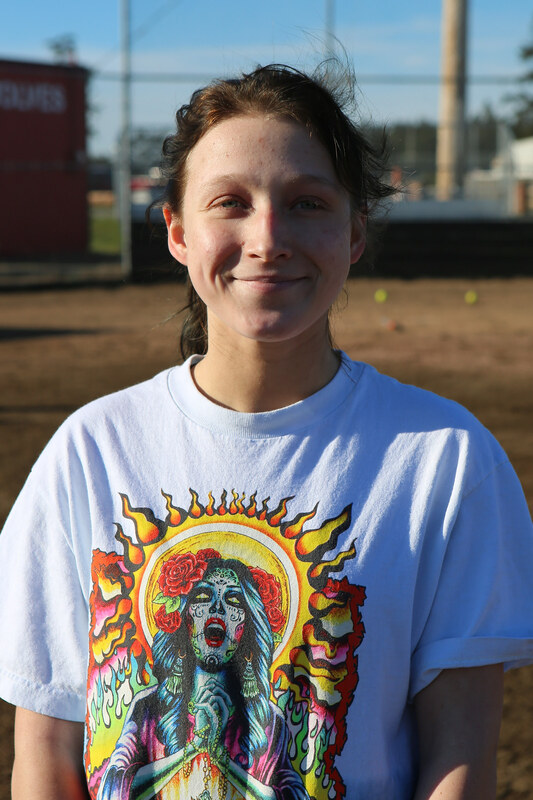 The Coupeville High School junior softball slugger isn’t a full-time starter (yet) or an All-Conference player (yet), but she is the sort of player every coach, and fan, appreciates. A hard worker, always upbeat, always supporting her teammates, a quiet but friendly, intelligent young woman with aspirations of helping others one day as a substance abuse counselor. Playing on a team with a deep, experienced roster, Wheeler has had to wait for her opportunities, but Wednesday afternoon, given one, she soared. Getting the first varsity hit of her career, she didn’t dribble a hit back up the middle, or chop a roller that evaded a glove. Instead, swinging from the heels, Wheeler belted a two-run double to the deepest, darkest part of left field, a blow which sent the ball skidding off the wall while her teammates pounded the dugout fence. Part of a furious final-inning rally which fell just short in a 12-8 loss to host Granite Falls, her big bash speaks well for her future, and her team’s. While the defeat drops Coupeville a game back of Granite in the chase for a North Sound Conference title, there are still six league rumbles left on the schedule. And with the final rally sparked by consecutive hits from their 5-6-7-8-9 hitters, the Wolves may have found a way to balance a hot-hitting top of the order with what has been a somewhat lukewarm-hitting bottom of the lineup. For now, Granite sits at 5-1 in league play, 8-5 overall, with Coupeville (4-2, 6-6), Cedar Park Christian (3-2, 8-3), Sultan (1-4, 1-7), and South Whidbey (1-5, 4-8) in pursuit. After a non-conference game Saturday against Meridian, CHS wades into the second half of league play, a time when they will play cellar dwellers Sultan and South Whidbey twice apiece. Coupeville also has a road game against CPC, which it has taken two games from, and a home clash with Granite, the only conference squad it hasn’t fully solved yet. Wednesday’s game was much closer than the first meeting between the two teams, when a rash of errors on fly balls doomed the Wolves in a somewhat-lopsided 23-11 loss. This time out, Coupeville fell behind early, trailing 8-1 after two innings, then largely controlled the game in the latter stages. Freshman hurler Izzy Wells, who started in left field, but then moved into the pitcher’s circle early in the second inning, whiffed eight Tigers, while the Wolves collected 14 hits. “Well, our bats were half awake through six and in the 7th came alive,” said CHS coach Kevin McGranahan. “Much better than last time, so we are making progress. Coupeville jumped out to a quick 1-0 lead in the top of the first, but were denied more when Granite pulled off a slick double play, the first of two times the Tigers closed an inning with a twin killing. Wolf lead-off hitter Scout Smith, making her first plate appearance since conking a walk-off grand slam against Cedar Park Monday, lashed a double to deep center to get things crackin’. After advancing to third on a ground-out, she alertly bolted home when the Granite catcher airmailed a pick-off throw into left field. Then things went sour for an inning-and-a-half, and that proved largely to be the game. 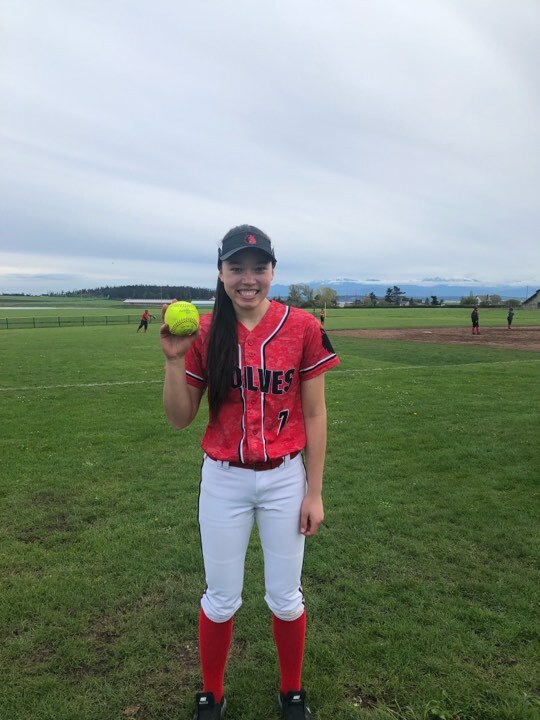 The Tigers plated three in their half of the first and another five in the second, while Coupeville lost second baseman Coral Caveness when she was drilled in the elbow with a pitch. Any time you wear a pitch it hurts, but this wayward heave connected with bone with a sickening thwack which carried across multiple fields, forcing the CHS sophomore to spend the rest of the game icing an arm which progressively swelled. Trailing 8-1 and down a player headed into the third, things looked bleak for the Wolves, but they went to work, chipping away at Granite. A spark of offense in the third, set up by singles from Emma Mathusek and Chelsea Prescott, and delivered by a thunderous two-run single off of Veronica Crownover’s smokin’ bat, cut the lead to 8-3. Unfortunately for the Wolf faithful, Granite went back into lock-down mode for a bit after that, before adding three runs in the fourth for a mini-rally which was greatly helped by a field ump absolutely whiffing on a call. Somehow ignoring Prescott slapping a tag on a runner going by, even though he was peering right over the Wolf shortstop’s shoulder at the time, the blind man walking gave the home team extra life, and, to their credit, they took advantage. Each time Granite started to creep away, Coupeville would slice away at the lead, but was never able to find the magic key to unlocking a truly big inning. An RBI single from Mollie Bailey and a deep sac fly from Crownover in the fifth made it 11-5, before Granite tacked on a final run in the bottom of the inning. With Wells flinging liquid heat, Prescott and Smith made strong defensive plays behind their young ace, and the two teams marched to the final inning. Where the Wolves, a team which has launched multiple comeback wins this season, almost (but not quite) found another miracle. The run started after Granite shortstop Samantha Vanderwel, who had a sensational defensive day, robbed Wolf cleanup hitter Sarah Wright on a hard smash into the hole. Deciding to hit away from the Tiger superstar, who has a vacuum for a glove, and a cannon in place of a throwing arm, Coupeville found immediate success. Five straight hits, to be exact, with Bailey, Crownover, Nicole Laxton, Wells, and Wheeler all finding pay-dirt in the outfield, and three runners careening across home plate. Laxton picked up the first RBI, mashing a laser shot to right, before Wheeler got dynamic. When Smith followed the hitting outburst by walking to juice the bags with just one out, anything seemed possible. The Wolves had the tying run at the plate, the Granite hurler was on the ropes, and one more good pop would have fractured the local fans, who were collectively breathing into one giant brown paper sack in an attempt to not hyperventilate and pass out. But there would be no miracle finish for the visitors, as Mathusek and Prescott both launched high, arcing, deep blasts with big-time extra-base potential, only to see sure-handed Granite outfielders chase down the moon shots. Ten of Coupeville’s 12 players collected a hit Wednesday, with Crownover, Smith, Prescott, and Bailey each notching two base-knocks. Mackenzie Davis, Laxton, Wheeler, Mathusek, Wright, and Wells rounded out the hit parade. While it was a loss, it was a “good” loss, and now the countdown towards May 1, when the Tigers come to Whidbey, begins. When Scout Smith is older, when she’s in the coach’s box like her mom and dad before her, when she’s possibly coaching her own children, her mind may drift back. And, in that moment, she will be 16 years old again, a wiry fireball sauntering to the plate, the sun barely peeking out from behind a wall of clouds on the Coupeville prairie. Scooter will remember the roar of the crowd, the feel of the bat in her hands, the look of fear in the pitcher’s eyes. It will be April 15, 2019 one more time. And then, as she squeezes her eyes shut, she will relive the moment she went from being a very good softball player to stepping into history, forever etching her name among the prairie legends. All she needed was a hit, a poke into open space, a bouncer back up the middle, a way to plate Veronica Crownover and cap one of the great comeback wins in school history. But very good softball players bounce the winner back up the middle. Legends beat the ever-livin’ snot out of the ball and bash epic walk-off grand-slam home runs. Scout Smith is no longer a very good softball player. She’s a legend. And so it came to pass, that the Wolf softball sluggers, after rallying for three runs in the bottom of the seventh to force extra innings, crushed the very soul out of Cedar Park Christian, winning 8-4 on Smith’s blast in the bottom of the ninth. The win lifts Coupeville to 4-1 in North Sound Conference play, 6-5 overall, leaving them in a first-place tie with Granite Falls (4-1, 7-5), while Cedar Park (3-2, 7-3) falls a game off the lead. Riding the high of Monday’s victory, the Wolves travel to Granite Wednesday, where they will bid to take complete control of the league in one 72-hour tear. For the moment, they will bask in a win in which they never held the lead until the final swing of the game. Freshman hurler Izzy Wells was droppin’ fire, whiffing 11 CPC hitters, and the Wolf defense played inspired ball. It didn’t matter where the ball was hit, because a Wolf (and her glove) were there to deny the Eagles time and again. Wolf catcher Sarah Wright picked runners off multiple bases, shortstop Chelsea Prescott nailed a runner coming home with a sizzlin’ throw, Crownover pulled off multiple unassisted put-outs at first, and somehow Emma Mathusek topped them all. Running on a full-out sprint in the 7th inning, the Wolf junior flat-out robbed Cedar Park’s best hitter, throwing out her mitt at the last second to swipe a rapidly-dropping ball from the heavens. What looked like an extra-base hit became just another out, as Mathusek flipped the ball back in, then stalked away, almost daring anyone else to try and hit it within a mile of her mitt. And yet, as it came up to hit in the bottom of the seventh, Coupeville trailed 4-1, with just a fourth-inning Mollie Bailey RBI single to its credit, and things looked dire. The Wolves scraped together one run, mashing together a Wright single, a Bailey grounder which was booted for an error, and then a Crownover RBI single. But, as quickly as the final-inning rally began, it almost ended. A strikeout and a fielder’s choice grounder left the Wolves down to their final out, still trailing 4-2, while Cedar Park’s extremely-enthusiastic third-baseman celebrated as if the Eagles had just won a state title. If you didn’t know Wells was a freshman, nothing about the way she conducts herself on the softball diamond would give you a clue. Perhaps her insides are a bubbling cauldron of anxiety. It’s possible. But Wells projects extreme calmness. Whether she’s firing pitches into Wright’s mitt, pulling off web gems, or standing tall at the plate, Ms. Unflappable is the most self-assured 9th grader since Katrina McGranahan debuted in 2015. And, with the very same former Wolf ace sitting high in the stands, keeping up a pro-Izzy stream of comments, Wells responded. Down to her final strike, she whipped her bat through the gentle prairie breeze, rocketing a single into center field, sending Bailey and Coral Caveness careening for home, and suddenly we had a whole new ball game. Which almost ended on the very next batter. In her first three trips to the plate, Smith had put good bat on the ball, only to have CPC fielders run down her shots. Trip #4 was (almost) legendary, as she laced what looked like the game-winner, only to be denied one more time. Not on getting a hit, as the ball tore a chunk out of the outfield grass this time, but when an admittedly great relay throw nailed Wells by a fingertip at the plate. Wolf fans, seemingly denied the walk-off win, howled. They quickly got over it, however. Wells, who had been aces in the pitcher’s circle through seven innings, was lights out in the extra frames. She faced the minimum six hitters across the eight and ninth, punching out three Eagles on strikeouts, while getting some help from Bailey, who made a beautiful snag on a checked-swing liner down the third-base line. That set up magic time, otherwise known as the bottom of the ninth. Operating under softball’s sometimes odd rules, both teams started play in the 9th inning by being handing a free runner at second. While Cedar Park’s player never got more than an inch off the bag as Wells blitzed her teammates, Coupeville’s runner, Bailey, went a lot further. After skipping to third on a passed ball, she took time out from her busy afternoon to dance on the bag, then found herself with nowhere to go even as two more batters got on base. With one eye on Bailey, a CPC fielder booted Crownover’s chopper, but recovered quickly enough to keep the wily Wolf at third from scampering home. Bailey was similarly stuck when Caveness dumped an infield single in front of the third-baseman, then found herself forced at home on a Wells grounder. Bases juiced, two outs, edge of your seat, strangled cries from both sides, a prayer or two curling up into the sky. Body language told it all. The CPC hurler, so effective for so long, leaned back, a haunted look in her eyes, relentlessly snapping the ball into her glove, unable to control what had become a twitch over the final innings. It wasn’t just that she hit a home-run. She flat-out destroyed the ball, her bat ripping it nearly in half, sending it on a line up, up and away as Wolf fans exploded out of their seats, tripping over themselves and each other, a shower of sunflower seeds cascading to the Earth as Smith rounded third. The ball cleared the left field fence in a hurry, and Cow Town went crazy. It was history. It was a coronation. Bow before Scout Smith, Destroyer of Worlds. And be glad she’s on our side. As she hit home plate, she was mobbed by her teammates, who thumped on her, hugged her, and screamed in her ears until all she could do was stagger away, grin plastered from ear to ear. Caught up in the celebration, CHS coach Kevin McGranahan was a man sitting on cloud nine. “High school careers are made of nights like this and every girl in uniform contributed to this win,” he said. “Great team win!